The definition of a brogue is a strong accent, or a heavy oxford shoe, or a shoe of untanned leather. An Irish accent when speaking English is an example of a brogue. A man's oxford shoe with perforations and a wing tip is an example of a brogue. A leather shoe made of untanned leather that used to be worn frequently in Ireland is an example of a brogue. "brogue." YourDictionary, n.d. Web. 14 April 2019. <https://www.yourdictionary.com/BROGUE>. A heavy shoe of untanned leather, formerly worn in Scotland and Ireland. A strong oxford shoe, usually with ornamental perforations or wingtips. IrishScottish Gaelic bróg from Old Irish bróc shoe possibly from Old Norse brōk legging or from Old English brōc ; see breech . A strong dialectal accent, especially a strong Irish or Scottish accent when speaking English. A strong dialectal accent. In Ireland it used to be a term for Irish spoken with a strong English accent, but gradually changed to mean English spoken with a strong Irish accent as English control of Ireland gradually increased and Irish waned as the standard language. 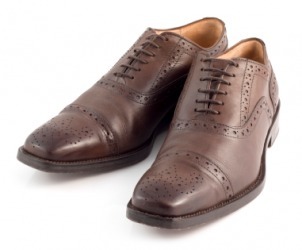 A strong Oxford shoe, with ornamental perforations and wing tips. (dated) A heavy shoe of untanned leather. (intransitive) To speak with a brogue (accent). To punch a hole in, as with an awl. From Irish bróg (“boot, shoe”). The "accent" sense may instead be derived from Old Irish barrog (“a hold (on the tongue)”). Designed in collaboration with Joy & Alexandre Herchcvitch, the shoes look every bit true to their brogue inspiration, complete with perforated dots, laces and a dainty shape. "Burke," he says, describing a dinner party at Lord Fitzwilliam's in 1793, "has now got such a train after him as would sink anybody but himself: his son, who is quite nauseated by all mankind; his brother, who is liked better than his son, but is rather oppressive with animal spirits and brogue; and his cousin, William Burke, who is just returned unexpectedly from India, as much ruined as when he went years ago, and who is a fresh charge on any prospects of power Burke may ever have.